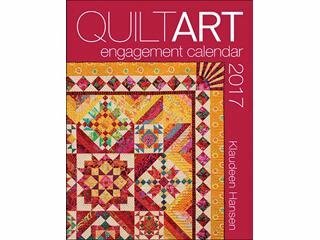 American Quilter's Society Quilt Art Engagement Calendar 2017- Keep track of your year and be inspired all at the same time. This spiral-bound calendar can lay flat open with a beautiful photo of a quilt on the left and a week of blank days on the right. With a stunning new quilt for each week of the year you'll find yourself seeking a peak at the future. Great for yourself or as a gift for a friend. 110 pages in a spiral-bound soft cover that also contains a small calendar for the year 2018 in the back with an area for notes on its reverse side.